Almighty God, to serve you is to reign; grant that, with the help of Saint Casimir's intercession, we may constantly serve you in holiness and justice. Through our Lord Jesus Christ, your Son, who lives and reigns with you in the unity of the Holy Spirit, one God, for ever and ever. Today is the feast of St. Casimir who was born in 1458 and was the son of the King of Poland. At an early age he saw through the superficiality and corruption of court life. Throughout his short life—he died of consumption at the age of 26—he dedicated himself wholly to the service of God and of his fellow-men. His love for the poor was immense. He was also renowned for his devotion to the Eucharist and to the Blessed Virgin. It is also the feast of St. Lucius I, pope in the 3rd century reputed to be a martyr. St. Casimir, to whom the Poles gave the title of "The Peace-maker," was the third of the thirteen children of Casimir IV, King of Poland, and of Elizabeth of Austria, daughter of the Emperor Albert II. ...Devout from his infancy, the boy gave himself up to devotion and penance, and had a horror of anything approaching softness or self-indulgence. His bed was often the ground, and he was wont to spend a great part of the night in prayer and meditation, chiefly on the passion of our Saviour. His clothes were plain, and under them he wore a hairshirt. Living always in the presence of God, he was invariably serene and cheerful, and pleasant to all. The saint's love of God showed itself in his love of the poor who are Christ's members, and for the relief of these the young prince gave all he possessed, using in their behalf the influence he had with his father and with his brother Ladislaus when he became king of Bohemia. In honour of the Blessed Virgin Mary, Casimir frequently recited the long Latin hymn "Omni die dic Mariae," a copy of which was by his desire buried with him. This hymn, part of which is familiar to us through Bittleston's version, "Daily, daily sing to Mary," is not uncommonly called the Hymn of St Casimir, but it was certainly not composed by him; it is three centuries older than his time. 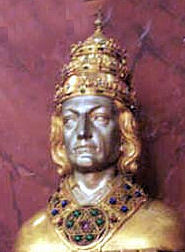 The nobles of Hungary, dissatisfied with their king, Matthias Corvinus, in 1471 begged the King of Poland to allow them to place his son Casimir on the throne. The saint, at that time not fifteen years old, was very unwilling to consent, but in obedience to his father he went to the frontier at the head of an army. There, hearing that Matthias had himself assembled a large body of troops, and finding that his own soldiers were deserting in large numbers because they could not get their pay, he decided upon the advice of his officers to return home. The knowledge that Pope Sixtus IV had sent an embassy to his father to deter him from the expedition made the young prince carry out his resolution with the firmer conviction that he was acting rightly. King Casimir, however, was greatly incensed at the failure of his ambitious projects and would not permit his son to return to Cracow, but relegated him to the castle of Dobzki. The young man obeyed and remained in confinement there for three months. Convinced of the injustice of the war upon which he had so nearly embarked, and determined to have no further part in these internecine conflicts which only facilitated the further progress into Europe of the Turks, St Casimir could never again be persuaded to take up arms though urged to do so by his father and invited once more by the disaffected Hungarian magnates. He returned to his studies and his prayers, though for a time he was viceroy in Poland during an absence of his father. An attempt was made to induce him to marry a daughter of the Emperor Frederick III, but he refused to relax the celibacy he had imposed on himself. St Casimir's austerities did nothing to help the lung trouble from which he suffered, and he died at the age of twenty-six in 1484 and was buried at Vilna, where his relics still rest in the church of St Stanislaus. Miracles were reported at his tomb, and he was canonized in 1521. 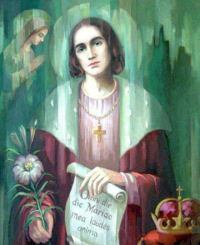 St. Casimir died at age 26 due to tuberculosis. Teach the young people in your family about this saint who was so ready to die at such a young age, that they may realize that sanctity is fully attainable regardless of their state in life. The story of Esther interceding on behalf of her people in today's reading is a real example of how morally influential a woman can be by virtue of her femininity. Not through leaving her femininity behind and seeking power did Esther impact her world for the good, but it was directly through her beautiful, pure womanhood that Esther swayed the King, her husband, to save her people. Tell this story to your daughters, if you have been blessed with any — they will love hearing it! Read Pope John Paul II's encyclical On the Dignity of Woman, and his message Women: Teachers of Peace to learn more about the mission of women in society today. St. Lucius, according to the "Liber Pontificalis," was a Roman, the son of Porphyrius. When he succeeded St. Comelius, the persecution of Trebonianus Gallus was still raging, and the new Pope was exiled. Soon, however, the persecution died away and Lucius was able to return to Rome. There is extant a letter from St. Cyprian congratulating the Pope on his return from exile and praising him for his confession of Christ. St. Lucius continued the policy of Cornelius in admitting repentant apostates to communion after due penance. St. Cyprian praises him for this. The "Liber Pontificalis" attributes to Pope Lucius a decree ordering that two priests and three deacons should live with a bishop that they might be witnesses for him. Duchesne, however, considers this decree apocryphal. According to the "Liber Pontificalis," Pope Lucius was beheaded in the persecution of Valerian. This is almost certainly inaccurate, for Lucius died before the persecution of Valerian broke out. At any rate, St. Lucius died some time in the beginning of March 254, and was buried in the Cemetery of Calixtus. His tombstone has been discovered. The feast of St. Lucius is kept on March 4.